Appcamp Kosovo was held during 2-4 November at the house of Innovation in Kosovo, gathering designers & developers to create mobile applications for Android and iOS, aiming to promote the newly Republic of Kosovo: News and Information, Culture, Heritage & Traditions, Tourism, Economy, and game/entertainment apps related to Kosovo. 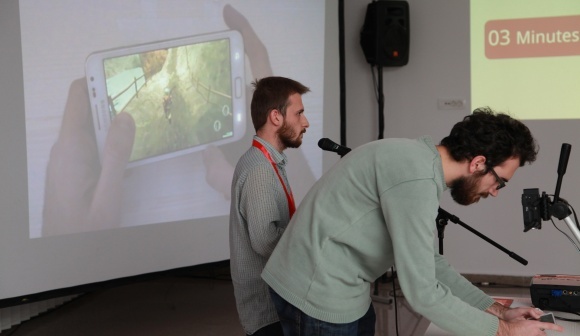 The Highland Lute, a game featuring mythological characters and environment from Kosovo, built on Unity Engine and suitable for iOS and Android based devices, was highly applauded as it was presented by two guys, who worked day and night to make their dream come true. “Now we look like cavemen, but it’s nothing compared to the emotion that we have on making a dream come true” said the founder of the Game Leart Zogjani, a very talented designer with exceptional drawing skills that achieved to create an amazing character, game environment and story, together with his teammate Bardh Lohaj, who was responsible for the development part. The grand prize for the first team was a cash prize of 3,000 Euro plus a free trip to Barcelona for Mobile World Congress 2013, while three other teams were awarded with 3,000 Euro each, representing apps about lifestyle, historic arcade game and exploring travel guide. It was the first time that AppCamp was held in Prishtina, Kosovo, with the support of the Ministry of Foreign Affairs of the Republic of Kosovo, IPKO Foundation, Norwegian Embassy, Innovation Centre Kosovo and the British Council, and attracted more than 100 participants to compete and build 16 prototypes/apps that were demonstrated using video mirroring. Action, not hope. Real prototype development, not power point presentations. If AppCamp Kosovo continues to bring together best community developers to build apps during a weekend, Kosovo digital strategy has a chance.